VRBO shared rentals are forbidden. So what happened here? Franklin Wu just found himself in a bizarre rental nightmare. He prepaid $9,000 for a four-month apartment rental in Switzerland. And although VRBO shared rentals aren’t allowed, when he arrived, the host made it clear she wasn’t leaving. So he did. But why did VRBO let the host keep his $9,000? This tale is a strange one. Wu did nothing wrong, and yet he almost lost thousands of dollars in this debacle — almost. Wu’s rental nightmare began when he went looking for a four-month rental in Lucerne. Wu would be traveling on a work visa as part of his employment. His wife and his cats would be coming along too. They needed an apartment that would accommodate them all. 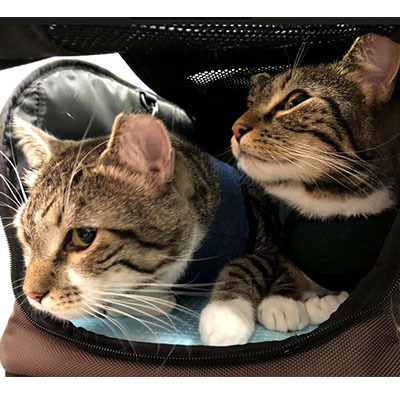 Wu’s cats on their way to adventures in Switzerland. The couple perused the listings on VRBO until they found one that would be available for their entire stay. Soon Wu found an apartment that seemed perfect — a well located, two-bedroom unit with availability from October to February. And it was pet-friendly. He contacted the owner through the VRBO communications platform. The host, Monica, quickly responded with pleasantries and a confirmation of availability. Monica also provided the address of the apartment so that Wu and his wife could verify its location. And then Wu prepaid around $9,000 for his family’s entire stay. But there was one last wrinkle to iron out of their plans. Wu’s wife needed some additional documentation for the Swiss migration office. So Wu wrote back to Monica to ask for written proof that she approved of his wife in the apartment. 2. Written confirmation of the landlord that they are fine that you have your wife living with you. I can provide the VRBO receipt as a form of lease contract. Maybe just a short statement saying that you know and approve my wife, Laura Kinkead, to also be residing with me in the apartment. Monica agreed to provide a landlord statement. But, in hindsight, what she sent Wu was the first clue of the rental nightmare to come. And this document would later come back to haunt Wu. More on that shortly. Wu completed the visa application for his wife, and the migration office approved it. Soon the couple and their cats would be on their way to their adventure in Switzerland. VRBO shared space rentals aren’t allowed. So what’s going on here? A few days before Wu and his clan arrived in Lucerne he emailed Monica. He asked how they would check in. Monica answered Wu with helpful information about how to navigate her neighborhood. She said that she had to work so she would leave a key in an envelope for the couple. Several days later Wu and his wife arrived at the apartment. All seemed fine. He texted Monica to confirm their arrival and to get the Wi-Fi code. Wu wondered why they would see her the next night. But he assumed she just wanted to meet them and acquaint them with the apartment. The next day Monica texted the couple to tell them she wouldn’t be there until late in the evening. Now Wu says it started to become clear that they may have somehow booked a shared space rental on VRBO. It was getting quite late. And now it was becoming more and more likely that we are in a shared space rental since a host check-in doesn’t typically occur past 11 p.m. We went to bed. Then we hear her arrive at approximately 1 in the morning. She left bright and early, well before we even woke up. The couple was thoroughly confused as to how they ended up in this predicament. Wu went back to the original VRBO listing — there was no mention of this being a shared space rental. Having no desire to spend four months living with a stranger — even a friendly one — Wu immediately contacted VRBO. VRBO stated that renting shared spaces was strictly not allowed on their site, and therefore the property owner was in violation of VRBO’s terms and conditions. VRBO stated we were entitled to a full refund. Lastly, VRBO stated that they would provide a hotel room for us to stay in while we figured out a rebooking. Relieved that it appeared their $9,000 was not in jeopardy, the couple accepted relocation to a hotel. As they were preparing to leave, the host returned. Wu said that his wife calmly explained all that the VRBO representative had told them. She told Monica that at no time did they expect to be in a shared space rental. And finally, Wu’s wife told Monica that the couple expected a refund. Monica did not agree to the refund. Wu says Monica seemed confused as well, and she mentioned something about the listing coming from Airbnb — not VRBO. Getting nowhere with Monica, the couple gathered their things and their cats and left. It went on to describe the protections that renters have when a host cancels a property. The protections of the Book with Confidence Guarantee are also detailed on the VRBO/HomeAway website. As per the email, Wu and his wife should visit the VRBO website and find a suitable, replacement apartment. VRBO would cover the cost of their hotel until they could move to a new location. So, the duo set about finding a new apartment — pleased that this little rental nightmare seemed to be over. In reality, this rental nightmare was only just getting started. The next day, Wu woke to an email from “Carrie,” a first-name-only VRBO representative. In that correspondence, Carrie accused Wu of “breach of contract.” She told him that her team had reviewed the case and spoken to the host. Her resolution team had determined that Wu knew that he was renting a shared space rental. HomeAway was notified that contact to the owner was made off platform requesting specific information. An affidavit was signed and sent to you per your request and acknowledgment and acceptance was made by you. There was an agreement made between the owner and yourself about the living accommodations which you accepted these terms. Since you have requested to leave the home and not stay, you are breaking that contract which voids out eligibility for our Book With Confidence and rebooking assistance. Carrie’s letter went on to clarify that VRBO would offer no further assistance to the couple and would provide no refund. Carrie did suggest, though, that the couple could book a new property — and pay for it. Wu was stunned. 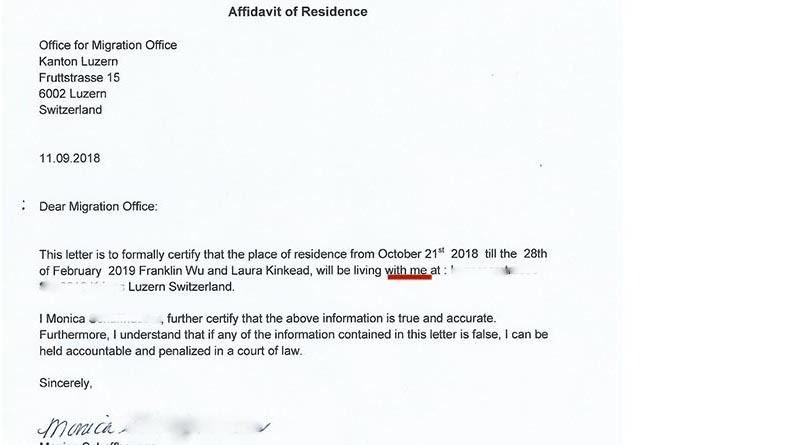 He had asked for the referenced affidavit because the Swiss migration office required it in order to approve his wife’s visa. It had nothing to do with a shared space rental. His wife’s application needed to include her name on a lease or a notice from a landlord that she was part of the lease. And now he was thoroughly confused. What was Carrie talking about? Not knowing what else to do, Wu submitted a desperate plea for help to the Elliott Advocacy team. Does VRBO allow shared space rentals? When I read through Wu’s complaint, I wondered what had gone wrong here. VRBO does not permit shared space rentals. This information can easily be found on the VRBO website. Wu was never looking for a shared space rental. He was merely looking for a place for his family to stay during his time in Switzerland. He had no motivation to share a property with a stranger. So this entire turn of events bewildered him — especially VRBO’s sudden change of attitude toward his family’s plight. I took a look at the affidavit. Monica does say that the couple will be living “with me.” Although the wording was a little strange, I didn’t think that alone should be used to make a $9,000 decision. Carrie must have had additional proof that Wu knew this was a shared space rental. Did the VRBO resolution team base its initial decision on those two little words? Wu told me that VRBO offered nothing else as proof that he was a willing participant in this shared space rental. The executive VRBO team conducted a thorough investigation of Wu’s case. About a week later came the good news. Our executive contact reiterated that neither VRBO nor HomeAway allows shared space rentals. VRBO has removed Monica’s listing from both sites. And VRBO agreed to refund Wu’s $9,000 and help rehouse the couple. Additionally, VRBO agreed to pay the difference between the new rental and the surprise shared space rental. Wu is thrilled with this positive resolution and happy that this rental nightmare is truly over. In the end, he and his wife located an alternative property and are happily settled in with their cats as their only additional roommates. And that’s just the way they want it. Do you think the affidavit proved that Wu knew the property was a shared space rental? Posted in Advice Tagged HE NEVER WANTED TO SHARE THIS RENTAL WITH A STRANGER, HERE'S A VACATION RENTAL NIGHTMARE, HOW DID END UP SHARING THIS VRBO RENTAL WITH A STRANGER?, NO HE DOESN'T WANT THE VRBO HOST FOR A ROOMMATE, NO SHARED SPACE RENTALS ARE ALLOWED ON VRBO, VRBO FORBIDS HOSTS FROM RENTING SHARED SPACE IN THEIR HOMES, VRBO RENTAL NIGHTMARE, WILL HIS $9000 RENTAL NIGHTMARE EVER END?